Warning: To Avoid Danger Of Suffocation, Keep All Plastic Bags Away From Children And Pets. Do Not Place In Or Around Cribs, Beds, Carriages Or Playpens. Choking Can Result From Anything Children Put In Their Mouths. To Avoid The Risk, Do Not Allow Children To Tear Or Play With Diapers. 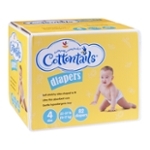 Discard Any Torn Or Unsealed Diapers. Caution: Diapers, Like Any Article Of Clothing, Will Burn If Exposed To Flame. Always Keep Children Away From Any Source Of Flame. Disposal: Please Be Considerate And Sanitary When Disposing Of Soiled Diapers. Shake Contents Into Toilet Before Discarding. Wrap Diaper Inside Its Outer Cover Before Discarding In Waste Receptacle. Do Not Flush Diaper. If You Notice A Small Amount Of Gel-like Material On Your Baby's Skin Do Not Be Alarmed. This Comes From The Diaper Padding And Can Be Wiped Away With A Soft Cloth.